Endnotes and copyright credits are given at the foot of this page. Landscape artist, poet, sculptor, and painter Ian Hamilton Finlay was born in 1925 in Nassau, Bahamas, and returned to Scotland as a child. After a childhood inflected by poverty in Glasgow he left school at thirteen with the outbreak of war when he was evacuated to the Orkneys. Later he served in the army and saw service in Germany. He started his artistic career in conventional poetry and short story formats in his books The Sea Bed and Other Stories (1958), The Dancers Inherit the Party (1960), and Glasgow Beasts (1962). Although his early work was admired in America by such poets as Robert Creeley, Robert Duncan and Lorine Niedecker, it was not well received in Scotland. His pioneer contribution to the international Concrete Poetry Movement in the 1960s, in such works as Rapel (1963) and Canal Strip 3 and 4 (1964), has earned him the title ‘Scotland’s greatest concrete poet’. From the late 1960s to the present, Finlay’s art, has re-invented itself in the whole three-dimensional verbal / visual world of architectural installations, paintings, poster poems, and stone hewn pieces. He has produced an enormous amount of work exhibited around the world from the Tate Gallery to the Köller Müller Museum in Holland, the Max Planck Institute in Germany, and The Eric Fabre Gallery in Paris. But he is best known for his transformation of his farmhouse at Lanark, near Edinburgh, Scotland, which he started in 1966. The estate is a miniature ‘republic’ of symbolic sculptures, temples, and conceptual artistic pieces woven into the fabric of his garden’s flowers and water. 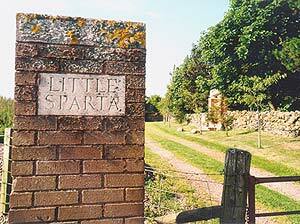 Finlay named it ‘Little Sparta’. Experimenting in the realms of the composite artistic forms and materials, Finlay’s art enacts a process of multi-layered aesthetic symbolisation of history and mythology, of nature and culture; a process of collaboration and search for ever more artistic possibilities embodying his contemplative moral and aesthetic reflections. It is not a question of generic identity and textual or contextual ingenuity that stimulates one’s curiosity and draws one’s attention to Finlay’s work. Nor is it a question of ideals, reflecting upon the perfectionist, almost romantic, conclusions he draws about his culture’s increasing ‘secularization’ and lake of piety. For me, the strength of his work’s particularity lies in its extraordinary ability to interrogate fundamental concepts of artistic articulation while proving itself both politically and culturally — neither classical nor traditional as Finlay himself declares — but both Sublime, and decidedly contemporary. Within the realm of transcendent values and thoughts, Finlay’s aesthetic articulates a critical distance of philosophical contemplation and reflections, and within the realm of history and mythology his artistic compositions diminish allusionist and metaphoric distances between references and symbolic connotations. In both, the presence and the absence of particular abstract distances, Finlay’s aesthetic invents its own reality and its own realism. Indeed, his break with the discursive linear poetry in his first collection of concrete poetry Rapel (1963) was followed by another shift from concrete poetry’s paginated limits into the wider horizons of the land, the sea, and the literally structured word. Finlay’s work reflects those moments of hidden but established individuality which articulates postmodernity’s concern for undermining what one American poet terms ‘the fallacy of the poetic I’ [Note 1], and what Finlay himself calls poetic ‘self-extensions’. [Note 2] His aesthetic seems more akin to that Multi-media, inter-discoursial spirit we so often associate with post-modern sensibility than to the classical cultural idioms and axioms that he so readily feels inhabiting. Such is the status of ‘a composer’ — as he himself comments — to whom materials of composition is ‘neither here nor there’, and to whom the purpose of composition is always to create the beautiful. This interview took place in Finlay’s house; Little Sparta (Stonypath), Dunsyre, Lanark, Scotland, on April 12th, 1996. Nagy Rashwan: Perhaps I can start by asking you: How would you define your present relationship with Concrete Poetry now? Finlay: As a friendly one. I would still like to write concrete poems, but I can only do it sometimes. For me concrete poetry was a particular way of using language which came out of a particular feeling , and I don’t have control over whether this feeling is in me or not. But if it is in me, I am very happy to write concrete poetry. I don’t feel it is in any way over for me. But I can only write what the muse allows me to write. I cannot choose, I can only do what I am given, and I feel pleased when I feel close to concrete poetry — still. At a specific stage of your career, say from the early sixties till the early seventies, you were almost completely identified as a concrete poet. Was concrete poetry just one artistic possibility that you felt to be available then? It was never for me an academic question. I just had this curious experience that I couldn’t any longer continue with the way I had been writing. I felt great problems about how to put words together in the simplest way. At that time I made little toys out of cardboard and wood — very simple ones. I really wanted to write concrete poetry but I didn’t know what it was — I had never heard of it. Latter when I saw an anthology of Brazilian concrete poetry I was very surprised because it was just what I had been talking about — and there it was. This was a confirming experience. At that time I was completely engrossed in concrete poetry, and I suppose I didn’t approve of people writing poetry that was not concrete. But of course concrete poetry was much disapproved of — you were much criticised for doing it. Also many people thought they were writing concrete poetry when they weren’t really writing concrete poetry. Concrete poetry came out of a particular kind of experience, which in some way was being shared by different individuals all over the world — one of those inexplicable things. However, it was somehow spoilt a bit by becoming fashionable, though it was never accepted. In a way, becoming fashionable spoilt it for me, I think. The point is that I felt that the way I had written, I couldn’t continue with any more. It was a big mystery for me — why I felt I couldn’t put the words together the way I was used to — but I felt there must be some other way of putting the words together, and this for me was concrete poetry — I didn’t want to do anything else and couldn’t imagine doing anything else. But it was never an intellectual academic question for me — it was like an intuition; a deep feeling which was quite strange. I didn’t know where it came from, or what it was — it was a longing of some sort. How about latter development in the Brazilian concrete poetry, for instance, Augusto DeCampos’s ‘Popcrete’ poetry, and Decio Pignatari’s and Luiz Angelo Pinto’s Semiotic poetry ? I didn’t approve of de Campos’s ‘Popcrete’ at all — I thought it was very wicked. As for Pignatari’s Semiotic work, I thought some of it wasn’t bad. Some of it was quite interesting and quite pure — but the Pop-thing, I didn’t approve of at all. I took moral exception to it; I thought it was very impure — in a Scottish sense, I thought it was wrong. How would you describe your poetry’s subsequent developments, when you started incorporating other elements in your work — in the garden for example? would you consider this broadening of concrete poetry or would you consider it as something other than concrete poetry? 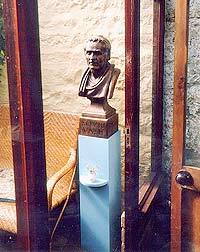 Some works I would do outside would be what you would consider a broadening of it, and other works derive more from the classical traditions. But at the beginning it was clear to me that concrete poetry was peculiarly suited for using in public settings. This was my idea, but of course I never really much got the chance to do it. Nobody was interested or there was no money or whatever. I would have liked to do it — I used to have dreams about doing big concrete poems. In Stuttgart I got to do some works like this. 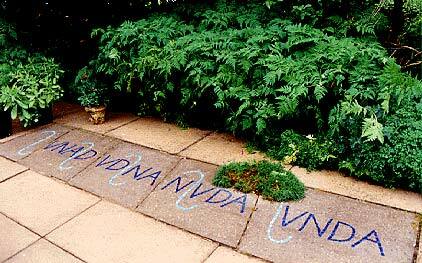 Image: Ian Hamilton Finlay: Unda, in Finlay's garden. Do you think your sense of broadening the possibilities of your art; your sense of incorporating architecture, for example, in your work, might have been present then when you were considered primarily to be a concrete poet who is interested in artistic experiments? Yes, but there are three issues involved here; firstly, what you want to do, secondly, what the institutions allows you to do, and finally what the material situation allows you to do. I mean I had no money. If I wanted to do a poem on glass or something, it was a big problem for me. There was no easy way of my doing it — I hardly had any money, I was often hungry and so on. So the material situation; the lack of financial resources, along with the lack of support, moral or material, from the institutions of art, often hindered and confined your investigation for new artistic possibilities at that stage. Considering your work more generally, would it be accurate to say that your vision of contemporary culture’s increasing secularisation and increasing loss of piety has motivated your return to classical references? Yes, I think we have created a culture in which there is a complete absence of piety of any kind. And piety was always an ingredient of culture. But, when one uses the word ‘piety’ now, nobody knows what you mean by it. They think perhaps you mean some narrow Christian piety or something dogmatic. As a feeling, piety is almost completely absent from our culture — and I deplore this situation. And this is perhaps partly responsible for my classical inclination, which may have also arisen because, when I started working with letter cutters, most of them would actually do Roman-type letters. So, the act of writing texts that suit that type of letters led me to the classical. Also, I suppose, the idea of harmony is implicit in the classical and is implicit in me, but again it seems to be lost in our culture. Nobody speaks about it any more, and it seems to me to be very important. I suppose also I came to classicism through reading philosophy, but I suppose the interest was already in me or I wouldn’t have read philosophy. So, the classical impulse in your art has also been motivated by the ‘lack of harmony’ in the culture, and even in art? Not even in art, specially in art. But also things come into you from outside and you might not know why. I mean my grandfather was in charge of the sawmill at Hopetoun House — quite a famous big classical house near Edinburgh. My father’s sister lived in this little cottage, and my uncle was a night watchman in this big house and, who knows, maybe my work has been partially inspired by memories of the grounds, the lands and the deer and the classical house — who knows? But I know when I started the garden my inclination towards the classical was increased. But, of course everything for me has been home-made. I was never at university or anything. I was always in the outside — so, I worked things out for myself. Quite a number of critics have compared your distinction between ‘the poetry of anguish and self’ and ‘the concrete as a model of order’ [Note 3] with Gomringer’s sense that concrete poetry offers a particularly orderly poetic ‘play-area’ [Note 4].How do you respond to this comparison ? These concepts are of course classical formulations. I didn’t get them from the classical, I got them from my own self, but I can see that they are expressions of a kind of classical attitude. I mean pre-Socratic Greek philosophy is never about ‘self’ at all. As for Gomringer, I think he is a very nice poet, but a very modern man. I am not a modern man, I am just a wee old fashioned one. I like Gomringer’s poetry, it is very pure and the absence of humour in his work is very good too — because a lot of concrete poetry was spoilt by becoming merely witty; wit has made it very limited. Would you agree with Charles Jencks that your work is a ‘post-modern mock-heroic genre [Note 5]‘. No, my work is not satiric and is not mock-heroic. This is Charles Jencks describing himself may be, but not me. I would never say this, such genre is completely forbidden for me. Perhaps the concept of ‘parody’ as defined by Linda Hutcheon might more accurately describe the classical impulse in your work? [Note 6]. Hutcheon defines parody as a dialogue which the artist opens with the works of classical antiquity in order to redefine the past through the present without losing either the present’s ‘newness’ or the past’s ‘classicity’. Yes, but I don’t feel a distance between me and the classical. To me it represents quite a natural language. Other languages could be natural too, but I don’t feel outside the classical. It is clear that most people when they think about these things, their biggest experience is of a distance. I don’t have that experience. I have often said that just as the French revolution, for instance, understood itself through antiquity, I think our time can be understood through the French revolution. It is quite a natural process to use other times to understand your own time. It offers a kind of dramatic possibility or something like that. Of course our time does not try to understand itself at all, unfortunately, but times have always understood themselves through other times which provide a means of dramatising the issues of the present. Do you think this might be the reason why some critics find your work so challenging? Not only because of its variety of artistic genres and materials, but also because of its complex relationship with the classical? Duncan Glen, for example, concludes that the only way to come to terms with your work is simply by accepting its ‘rich ambiguities’ [Note 7]. ‘Ambiguous’, of course, implies disapproval, but to me it could also mean ‘complicated’. However, this is not what they mean, they mean that they disapprove of it; that it is not politically correct, that it is unfashionable; or out with the pressure of fashion in them, or something like that. Does your work consciously challenge ‘fashionable’ artistic categories? No, I don’t make my work in order to challenge or confuse other people’s expectations — I only do what I find natural. But my work seems different to these people’s expectations, and they never fail to remind me of this difference. I don’t know why they find it challenging. People have always found me challenging — I don’t know why, when I am only being myself. I don’t understand why they find me so annoying but they do. It is pity, but that is how it is. Your collaborations with other artists and craftsmen in the production of your work, have led critics to raise the question of their authorship and originality. Stuart Mills, for example, argues: ‘further problems arise when he collaborates with other artists, so raising the question of authorship’ [Note 8]. How would you respond to these observations? I came to these mediums through having the garden, and of course, people who have designed gardens have always worked in collaboration, and never made their own inscriptions. Shenstine, for example, didn’t make the inscriptions in his garden — he wrote the inscriptions, but somebody else carved them for him. 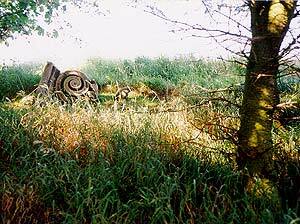 Nor did Capability Brown also make the sculptures in his gardens. So, it is quite natural for me to collaborate. Of course when you go out from the garden into exhibitions such collaborations may not seem so natural. However , it has to be said that many famous artists today do collaborate, but they don’t say so — they don’t acknowledge their collaborators, but I do. Not all your collaborators have been happy ones. Can you tell me about your dispute with Fulcrum Press? The dispute with Fulcrum Press was quite bizarre. The Dancers Inherit The Party had been published twice, and Fulcrum Press asked if they could publish it again and, after I had signed the contract, they informed me that they intended to describe it as a first edition. But it patently was not a first edition, it was a third edition. At this point I wrote to the Arts Council of Great Britain because they gave a grant to the publisher and I said public money shouldn’t be used to subsidise fraudulent editions. This is very clear and quite simple, but they wrote back to me very rudely telling me to mind your own business, and things like that. So, I wrote to the Scottish Arts Council, which had short-listed the second edition of the book for a prize two years before. They told me that if London says that it is a first edition then it must be a first edition. Then I wrote to the Association of Little Presses and they said something like; ‘You’re selfishly spoiling a good racket’, because you get more money for the first edition! I found all this extraordinary! Then I got the parliamentary ombudsman to make an investigation and he consulted the British Museum who confirmed that the book couldn’t be a first edition. But when they were asked to say that publicly, they refused to do so. The National Library of Scotland, a copyright library which received editions of all my books, also refused to say anything. It is extraordinary that something so clear could be deliberately ignored like this. My position was really quite simple, I didn’t wish to take part in a fraud on the public. But at that time most poets either were published by Fulcrum, or wished to be published by Fulcrum, so they seemed to consider me a danger, and after six years I was completely isolated. Nobody spoke to me anymore, and people were saying ‘it is not nice to fight’ and all this kind of thing. So, then, I went to the Consumer Protection Department which sent the book to Sotheby’s whose expert on literary fraud, a man called Carter, said that it could not be a first edition, took the publisher to court, and got the ruling that I was right. It then took the Arts Council Of Great Britain a further two years to accept the court ruling and to apologise to me. But I was never forgiven, I was always reminded that I did something terrible. The fact that I was proven right counted for nothing at all. What people remembered was that I had cause a lot of trouble to these institutions by asking them to stand up and speak a simple truth. But it was very instructive to me! This was when I first realised what culture is. You also had a subsequent dispute with Strathclyde Regional Council over the commercial or the non-commercial status of your garden temple — another dispute which probably confirmed your sense of the secularity and materiality of contemporary culture? They won on a technicality and now I am supposed to pay a lot of money which I won’t pay. They cannot put me in prison — they can only come and take my possessions away from me, which I suppose they will do. Now I have closed the garden to the public. My position is that since the non-secular status of my garden is not recognised by the law; by the world of the public, then the garden can only be private. So, I closed the garden to the public. The Arts Council had the opportunity to solve this dispute. Many years ago the Sheriff’s Officer, tired of having to raid my temple, had a secret meeting with me and asked me how this dispute could be resolved. I suggested that since the Scottish Art Council advises the government on all the matters concerning the arts, he should ask them to give an opinion on the status or the nature of the building. In a meeting of the twenty two members of the Council, the evidence I had prepared was considered, but they voted unanimously to express no opinion at all. My view was that they could disagree with my opinion if they wished, but that they should fulfil their obligation to advice the government one way or the other, or they should all be removed from their positions. They were not removed, of course. Recently, I spoke to the Visual Director of the Scottish Arts Council and he told me that he wouldn’t contradict the Region because the Region might reduce its support for the arts. But what he really meant was that he wouldn’t contradict the Region for the general good of his job. The same sort of thing happened in my dispute with the National Trust book: Follies: A National Trust Guide, which implied that the only pleasure you can get from Folly architecture is by calling the architect mad, and by laughing at the architecture. When I wrote to the National Trust to remind them that their task is to preserve buildings and traditions remarking that this book was absolutely destructive, they wrote back to me very casually. So I started a whole campaign and got other people to join in. In the end they removed their name from the book, and told everybody that I was a Nazi supporter, and so on and so on, and they too never forgave me. At one stage of this dispute they told me that they would publish anything which made money! What can you say? This book treated some of the greatest English gardens as ‘follies’. This is an age that treats its whole past as something outside itself which it wishes to reject or mock or whatever. What can you say? It is madness — none of these battles should have existed. But, in each case people had a public position which made it reasonable to think that they should have defended certain values and they all found excuses not to do so. I would have supposed that their whole natural inclination would have been to defend these things, but it became clear that their natural inclination was the very opposite of this. So, in your terms, the tragedy of our culture is that it has lost all sense of responsibility towards its past? The condition of our culture is that it feels separated from the past and, of course, the past now becomes nothing more than two years ago or three years ago. It used to be thousands of years, then it became hundreds, and now anything that is not part of an instant of fashion is considered the past. Within the enclaves of university walls, you’re allowed to take about the past, but only of course in an academic manner. It is not allowed to be treated as ‘real’ or anything like that. Outside the university walls, you’re not allowed even to talk about it. To read Greek philosophy is suspect, and ‘elitist’. There used to be no such word, they had the word ‘educated’ instead. But now you’re not educated, you’re an elitist, and wicked. If art can open a channel of communication with the past, do you think that culture as a whole would then follow its example? No, because you would be asking the culture to do something it cannot do — it would have to change its being to be able to do that. For me, the crucial point is the destruction or the end of piety. The nineteenth century announced the death of God or the end of God. Our century, though it hasn’t been made clear yet, has announced the death of piety or the end of piety — there is no place for piety any longer. This is the problem today because piety seems to represent the condition of ‘objectivity’ in a culture — without piety nothing can be understood. It is hard to think of any previous age in which there has been this kind of absence of piety — piety took different forms, but it has never before been completely abandoned. Our age has abandoned it and that is why so many things become incomprehensible, and therefore cannot be spoken about. But you have to understand that I consider myself a very modest artist, or whatever, and not of importance really at all — it is quite embarrassing to me to be asked my opinion about things. I am only a wee Scottish poet on the outside of everything. This reminds me of your response to John J. Sharkey when he asked you to contribute to his anthology of concrete poetry ‘Mindplay’ of 1971when you replied that you didn’t feel involved in what was happening then [Note 9]. Yes, the idea of the avant-garde doesn’t seem to me to be relevant. Whether I am or not — who cares, it is not important. I mean what avant-garde is there in Britain? Nothing. Nothing that is not fashionable, completely acceptable to everybody, completely supported by the Arts Council — there is only state aided art. In this respect it seems that your work resists both the superficial novelty of fashion and the more radical sense of innovation associated with the avant-garde, and offers a general cultural critique based upon the aesthetic principles embedded in the classical which oppose the very idea of fashion and radical innovation. Your work seems concerned primarily with giving instances of what you think of as the beautiful; harmony, purity, devotion and heroism. Rather than celebrating the past on its own right, it seems to celebrate examples from the past that correspond to your vision of beauty. So the past seems to be a part of your present, rather than a substitute for your present. Yes, all these things are parts in a language that I can use. Some of your critics discuss your work in terms of binary oppositions between wit, humour, and the seriousness of a cultural critique, between surprising images of warfare and the peaceful content of harmony, purity and simplicity [Note 11]. Do you sense such frameworks in your vision? Not particularly, I don’t think of it that way at all. Maybe it comes out like this, but I don’t think of it in these terms at all. I do different work, some pastoral, some tragic; some this, and some that. I work with a range of things, but that is life, isn’t it. Presumably such critics are trying to detect generic patterns in your work? Yes, but I don’t think I have such patterns. How important for you is it that your references to such parts of life are successfully communicated by your work? How important for you is the process of communicating a specific content? This question is quite simple really. You assume some sort of common humanity which is accessible to everybody, and you try to remain true to that. Therefore, you don’t think, for example; ‘Is the National Trust going to understand this?’ or ‘Is so and so going to understand that?’. You just think ‘Is this pure or not?’. If the work is pure then you have to think it could be understood. If it is not understood it doesn’t mean that your work is not accessible. It doesn’t worry me, but, of course, I would be pleased if people liked my work. However, I don’t feel the world is looking over my shoulder when I am working — I never think about this at all. What I think about is trying to make my work pure, and if it is pure then it can be accessible. It is quite straight forward really. Do you think your concerns for classical values and for artistic purity differentiate your aesthetic from the concerns of Gomringer and the South American poets? Yes, it is different. They are more modern people than I am. I mean I was just a little outsider, hungry, without money, without a place in the world and so on. Somethings, however, I did share with them, but I think my concerns are often misunderstood. For example, a lot of people interpreted my dispute with Strathclyde Regional Council as one of the individual against bureaucracy, but this is not what it was at all. I used to get quite upset by getting supported by people who thought I was acting in an anarchic manner. I didn’t want support from such people; they misunderstood what the problem was. So, I made a rubber stamp to put on my letters to say: ‘the people has a right to rigorous bureaucracy’ which shocked everybody. Gomringer and the Noigandres Group really belong to a different world from mine — I mean Augusto, whom I used to write to, was a lawyer and lived in a flat in Sao Paulo, in Brazil. Look where I live. Gomringer was secretary to Max Bill and so on. You have to remember we had quite different lives. My life has always been on the outside. How would you describe your life; would you call it a life of a concrete poet; of an artist; of a cultural classicist? I think all of these things are to do with composing. What you compose with is neither here nor there, you compose with words, or you compose with stone plants and trees, or you compose with events; the Sheriff’s officer, or whatever. It is all a matter of composing and ‘order’. [Note 1] See Bob Perelman, The Marginalization of Poetry, (Princeton: Princeton University press, 1996), also see, Charles Bernstein, Content’s Dream, (Los Angeles, Sun & Moon, 1986). [Note 2] Ian Hamilton Finlay, ‘Letters to Ernst Jandl’, Chapman, no. 78-79, 1994, p.12. [Note 3] Ian Hamilton Finlay, Letter to Pierre Garnier, 17 September, 1963, Concrete Poetry: A world View, Mary Ellen Solt (ed. ), Indiana University Press, (London, 1970), p.84. [Note 4] Eugen Gomringer, ‘From Line To Constellation’ (1954), World view, Mary A. Solt (ed. ), p.67. [Note 5] Charles Jencks, ‘The Moral In Art: Reflections On The Finlays’ Wars’, CHAPMAN, double issue No. 78-79 (Edinburgh, 1994), p.165. [Note 6] Linda Hutcheon, ‘Theorizing The Post-Modern: Towards A Poetics’, The Post-Modern Reader, Charles Jencks (ed. ), Academy Editions ( London 1992), p.76. [Note 7] Duncan Glen, ‘Some Thoughts and Reminiscences’, CHAPMAN, double issue No. 78-79 (Edinburgh, 1994), p.23. [Note 8] Stuart Mills, ‘The Implications Of Poetry’, AKROS, Vol. 6, March (1972), p.29. [Note 9] John J. Sharkey, Mindplay: An Anthology of British Concrete Poetry, Lorrimer Publishing (London, 1971) p.16. 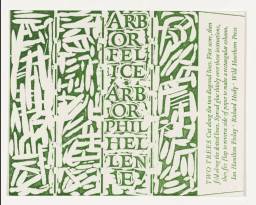 [Note 10] Ian Hamilton Finlay, interviewed by Nicholas Zurbrugg, Art & Design, profile No. 45 (London, 1995), p.47. [Note 11] For example, see Yves Abrioux’s ‘Eye, Judgement and Imagination: Words and Images from the French Revolution in the Work of Ian Hamilton Finlay’ (1994), p.156, and Thomas A. Clark’s ‘The Idiom of the Universe’ (1985), p. 131, in Wood Notes Wild, Alec Finlay (ed. ), Polygon, (Edinburgh, 1995). [Note 12] Ian Hamilton Finlay, Letter to Pierre Garnier (1963). 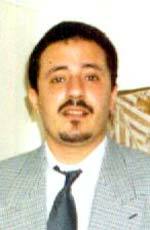 Nagy Rashwan is the author of Cultural Consciousness and the Myths of Conception (Cairo: GACP, 2000) and “Ian Hamilton Finlay and the Postmodern Impulse” under consideration for publication in 2002. He is currently working on a study entitled “Language Poetry and the Aesthetics of Postmodernism”, from De Montfort University, Leicester, UK. Photograph of “Unda” by The Stuart Collection, University of California. Poster and card poem reproductions courtesy Nagy Rashwan. The images are large and detailed, and take some time to download — please be patient.